An Articulate 360 Teams subscription gives you all the benefits of a personal Articulate 360 subscription plus easy team management, consolidated billing, priority support, unlimited storage space, and exclusive collaboration features. This article explains everything you need to know to get started with Articulate 360 Teams. Watch this video introduction, then jump into the details below. And check out the Articulate 360 Teams user guide for more info. Get everything you need for course development with Articulate 360, including award-winning authoring apps, 3+ million course assets, a simple project review app, live online training, exclusive collaboration features, and easy account management. 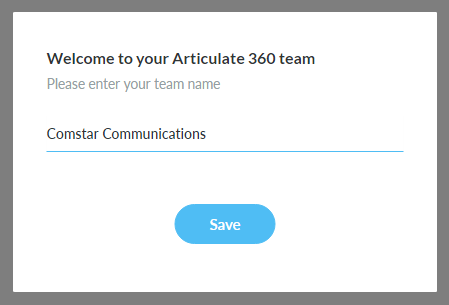 If you haven't already tried Articulate 360 Teams, sign up for a 60-day free trial and invite up to 10 additional users to join your team during the trial period. Learn more about free trials. When you’re ready to subscribe, click here and follow the prompts to complete your purchase. If you need help, let us know! We offer academic discounts for teachers and students at qualifying institutions and volume discounts for teams of five or more seats. See this article for all the pricing details and discounts. Articulate 360 Teams subscribers can pay via credit card or purchase order. And Articulate 360 Teams subscriptions are ideal when you need to purchase on behalf of someone else. For example, your company’s purchasing department might pay for a subscription then designate you as an admin for the account, allowing you to assign seats to users on your team. After buying a subscription, the account owner will be prompted to open the account management console and name the new team. Enter a name and click Save. It’s that easy! For example, you might use the name of your company as your team name. Learn more about naming, renaming, and switching between teams. There are four types of users in an Articulate 360 Teams account. The account owner is the person who bought the subscription and is responsible for billing management. The account owner is the only one who can buy more user seats. The account owner is also an account admin so he or she can manage all users, groups, and admins for the whole team. The account owner might not have a user seat by default. If the account owner needs to create e-learning courses, he or she must be assigned to a user seat to use the Articulate 360 apps. Account admins manage all users, groups, and admins for the whole team. Details here. Account admins can't make purchasing decisions, but they can ask the account owner to buy more user seats as your team grows. Admins don't consume user seats (by default), so you can have as many admins as you'd like. However, if admins need to manage the team and create e-learning courses, assign them to user seats so they can use the Articulate 360 apps. Group admins manage users in the groups they’re responsible for. They can’t see or manage other groups or admins in the account management console. Details here. Group admins can't make purchasing decisions, but they can ask the account owner to buy more user seats as your team grows. Users are seat holders. They have access to the Articulate 360 apps, such as Storyline 360 and Rise 360. Users create e-learning courses and collaborate on projects. You can only be a user on one team. You can’t be a user on multiple teams simultaneously. See this article for more information about roles and permissions. The account owner and account admins can add and remove other admins. Admins don’t consume user seats (unless they’ve been assigned to seats), so you can add as many admins to your team as you want. We recommend adding at least two admins in case one is unavailable when you need help. Sign in to your account management console and click Manage Team on the left side of the screen. Click the Admins tab below the team name. Click the last row, enter the new admin’s email address, and click Invite. New admins will receive an email invitation with instructions to create an account. You’ll want to show them how to manage users, groups, and admins. By default, all admins are account admins, meaning they can manage all users, groups, and admins for the whole team. You can change an account admin to a group admin (and vice versa). Details here. Hover over the admin you want to remove, click the X that appears, and click Remove. If you’re an account admin, make sure the Seats tab is selected below your team name. If you’re a group admin, you’ll see the groups you’re responsible for. Click an open seat, enter the new user’s email address, and click Invite. Tip: Account admins can import multiple users all at once rather than adding them one by one. List the users’ email addresses in a CSV file, then upload it to your account by clicking Upload a CSV on the seat management screen. See this article for details. Watch this video overview of all the Articulate 360 apps and resources. Install the Articulate 360 desktop app. Install the desktop-authoring apps, such as Storyline 360 and Studio 360. Learn how to use the web apps, such as Rise 360 and Review 360. Manage your profile, account, and preferences. Get answers to common questions in the Articulate 360 FAQs. Hover over the user you want to remove, click the X that appears, then click Remove. Their Articulate 360 apps stop working. Their content remains on our servers for at least six months, but they can’t edit or export their Rise 360 courses or access their Review 360 projects. Anyone who has direct links to their Rise 360 courses and Review 360 projects can still view them. If you later add users back to your team, their apps will start working again, and they’ll have access to their Rise 360 courses and Review 360 projects. As your team grows, buy more user seats right from your account management console. Admins can request more user seats, but only the account owner can purchase them. After signing in, click either Manage Team or Billing on the left side of the screen, then click Buy More Seats. See this article for details and answers to common questions. Let us know if you need help. Contact us at biz@articulate.com or (800) 861-4880 ext 2. Articulate 360 Teams subscribers get priority email support. Just submit a case, and you'll jump to the front of the line. Training: Participate in exclusive training webinars. They’re free for subscribers. Forums: Join discussions with e-learning professionals around the world. Tutorials: Find user guides and videos for all Articulate products. E-books: Download free e-books on e-learning topics and Articulate apps. FAQs: Get answers to common questions about Articulate 360. Documentation: Check out our knowledge base for instant answers.